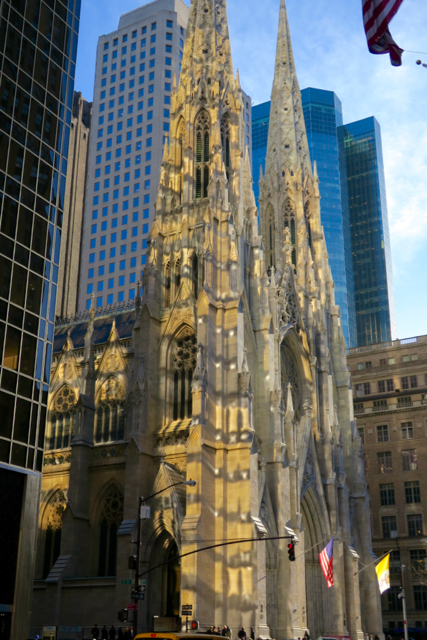 (Above) The dazzling cleaned and restored facade of St Patrick’s. 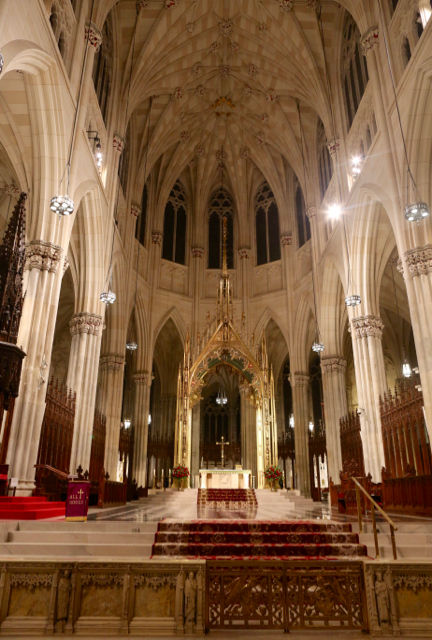 What more can the chronicler of Manhattan Catholic churches possibly say about this most visited church in the United States? What can the photographer add to the each day’s new stock of pictures taken by the hordes of tourists, usually futilely firing their flash? For nearly everyone in the world has been to St. Patrick’s by now, or so it seems. We will only attempt to add a few comments to a well-known story. My own memories go back to Cardinal Spellman’s era – to what now seems like a distant age. Thinking back to what I saw, I wonder at times if my memory is playing tricks now and then. Wasn’t there a life-size seated wax image of a pope in the vestibule of the cathedral – was it Pius XII? And nearby wasn’t there an American flag in a glass case – was it from the USS Arizona? For so many years, two favorite aunts of mine did duty behind the welcome desk at the entrance. After their death the cathedral hardly seemed the same to me. The welcome desk, too, seems empty most of the time nowadays. For in more recent years, the first welcome given the visitor is a search of any packages or bags being brought into the Cathedral. After an elderly usher was murdered in 1988, the visitor now is greeted by dark-suited professional ushers/guards. It seems that St. Patrick’s has moved high up on the potential hit list of terrorists. Saint Patrick’s was begun under Archbishop Hughes in 1859. The Civil War interrupted the work, which was only finished in 1879. The spires came even later in 1888. 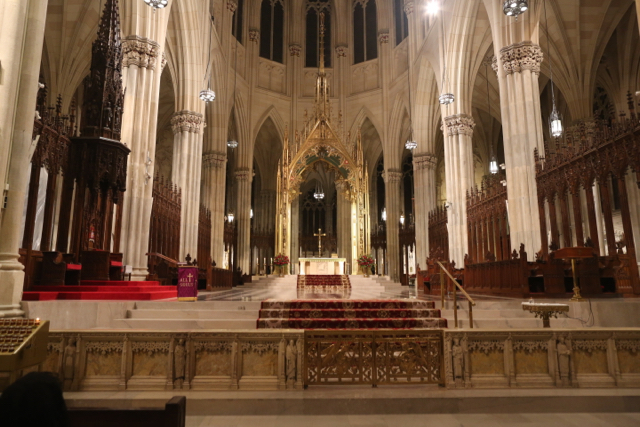 But when the work was done, the Catholics of New York, who had started out from a single church in downtown New York, now had the most magnificent church building in the United States. 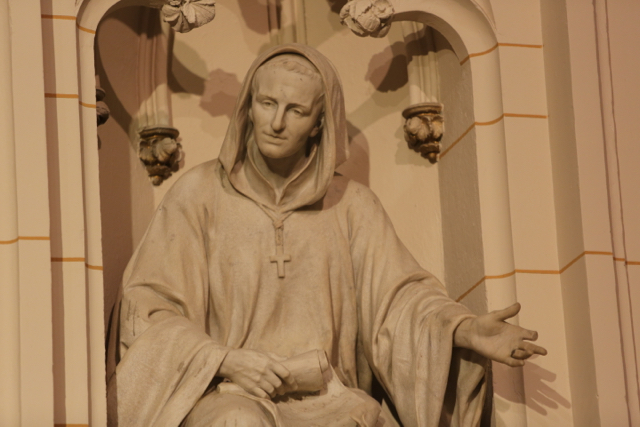 To those like the historian John Gilmarty Shea, who had experienced the end of those beginning years , the transformation of Catholic fortunes seemed almost miraculous. 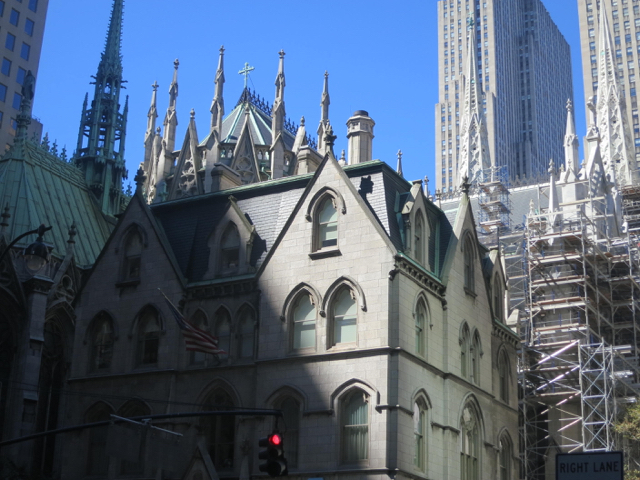 And by the time it was finished, the cathedral also found itself on the poshest residential street of New York City! These developments, of course, didn’t sit well with a certain segment of the Protestant New York; both the first 1879 guide to the cathedral and Cardinal Farley’s 1908 book on the history of the Cathedral felt compelled to devote extensive space to rebutting rumors (“believed by nine-tenths of the Protestant population”) that the land on which St. Patrick’s is located had been given to the Catholic Church by the City of New York for little or no consideration. 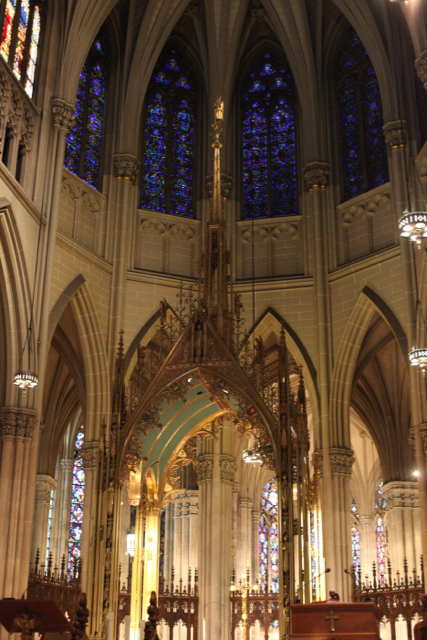 A more effective Protestant response to St Patrick’s was the building of the Cathedral of St. John the Divine. 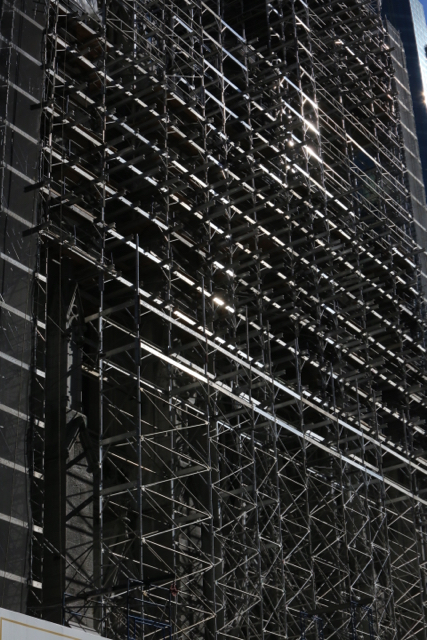 Now some aspects of that structure are even finer than St. Patrick’s; however, St. John’s was never finished. Moreover, for all its grand dimensions, Catholic architecture and array of national chapels, St. John’s remained the church of a limited, restrictive denomination. And its location was and is out of the way and for some decades was downright dangerous as well. Whereas even if the vicinity of Saint Patrick’s has changed over time from residential to commercial, the neighborhood has always remained upscale and the very center of town. Strangely, James Renwick’s St. Patrick’s Cathedral didn’t enjoy a good press among architectural critics until fairly recent times. 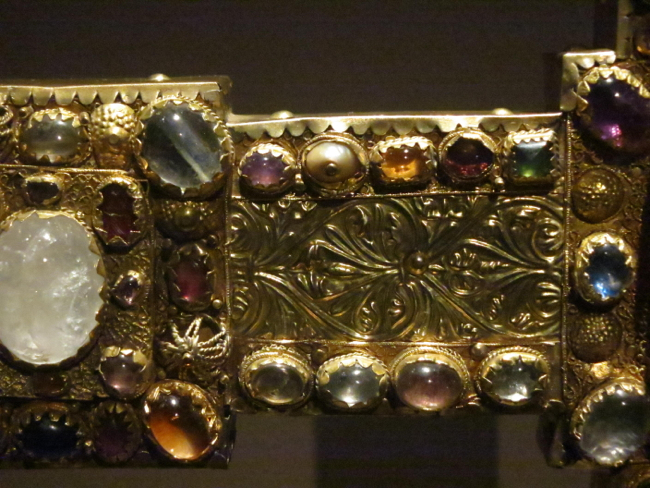 Undoubtedly that it was Roman Catholic contributed to that assessment. 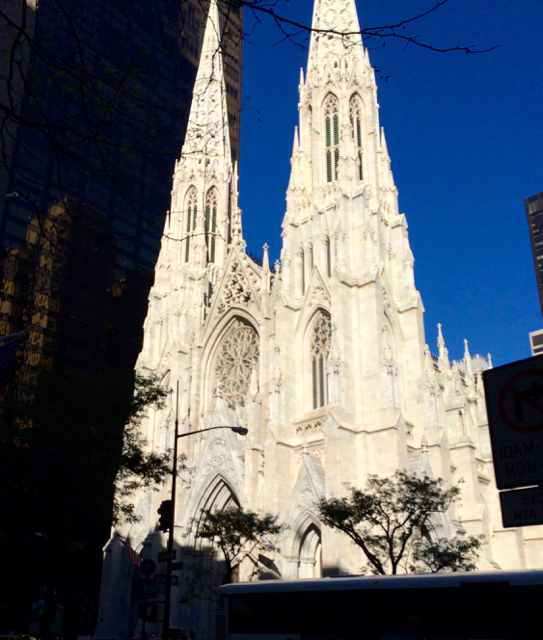 For who seriously can deny the cathedral makes a handsome appearance on Fifth Avenue? Its intricate spires, pinnacles and tracery contrast effectively with the block-like rectangular forms of the high-rise giants that surround it. 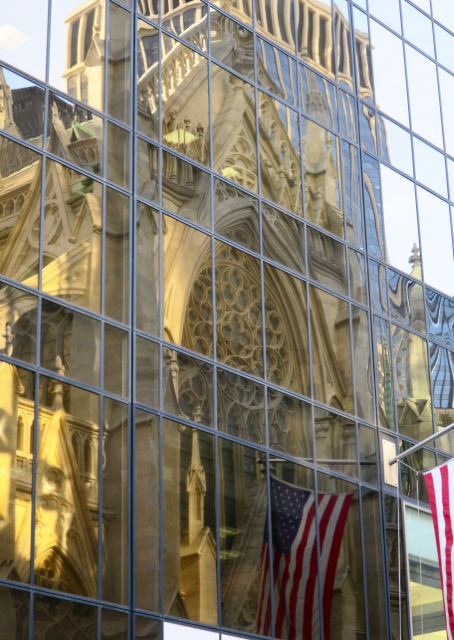 St. Patrick’s more than holds its own against these towers; indeed the facade of Rockefeller Center directly facing the Cathedral has been cleverly designed to subtly interact with the façade of St. Patrick’s. 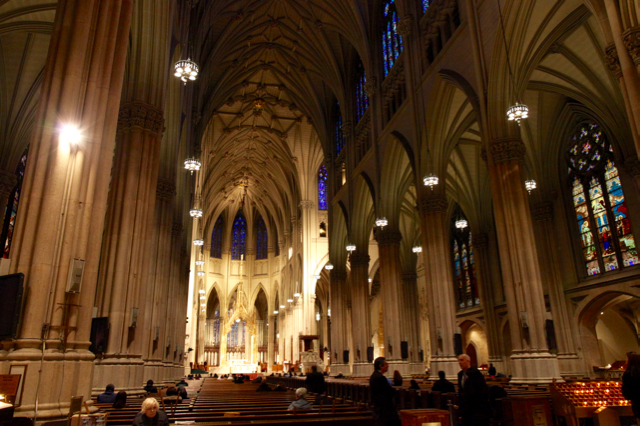 And the interior of St. Patrick’s is even better: spacious, well balanced and harmonious. It has a kind of serene “classical” harmony that contrasts with the drastic, overpowering and startling perspectives of the buildings and plazas of the Center across the street. 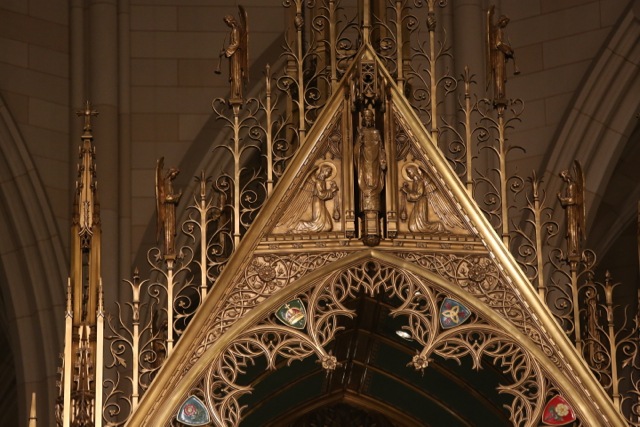 The deep blue clerestory windows of Charles Connick and the golden baldachin set exactly the right accents. The innumerable visitors each day seem to agree: all in all this is one of the most successful buildings in New York history! The completion of the cathedral, however, was only the start of the story. 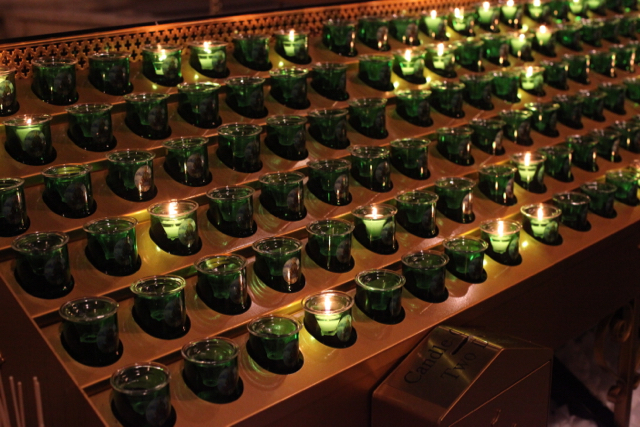 For unlike many other New York Catholic churches, the work at St. Patrick’s has never ceased. 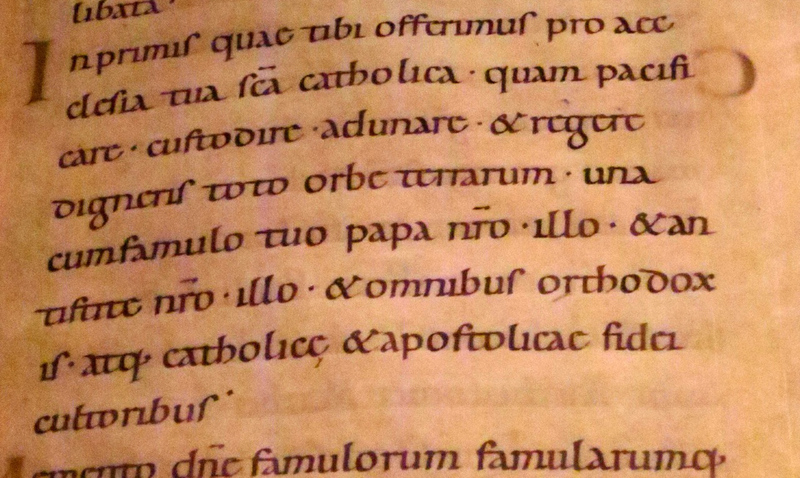 It seems as if every Archbishop of New York wanted to add his own touches. The side altars, the Stations of the Cross, and many statues were added from the 1880’s through the early 1900’s. 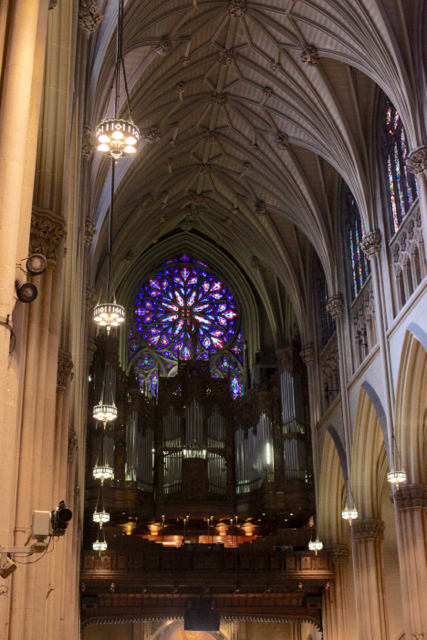 In 1901 the beautiful Lady Chapel, a high point of New York ecclesiastical architecture, was commenced; its decoration, especially the splendid windows of Paul Woodroffe, lasted until 1932. Cardinal Hayes added the grand organ in 1930 as part of a conscious and successful initiative to enhance the cathedral’s musical presence in the city. Finally, Cardinal Spellman carried out a major redecoration and restoration program in the 1940’s. 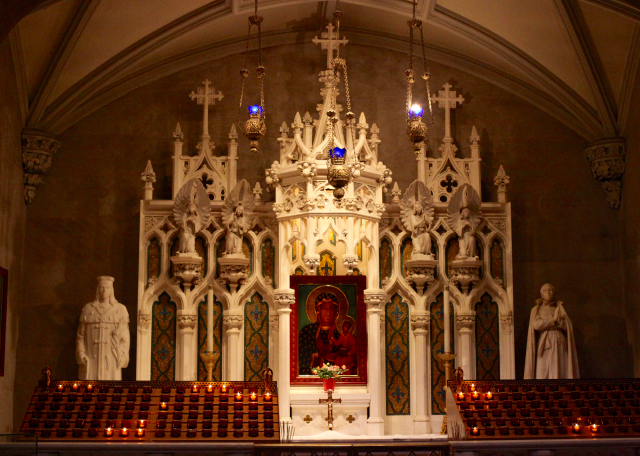 A new, more “liturgically correct” altar and a baldachin were installed in the sanctuary (part of the 1879 altar can be seen today in Fordham University chapel.) Massive bronze doors were provided for the facade. The Lady Chapel’s altar was redone. 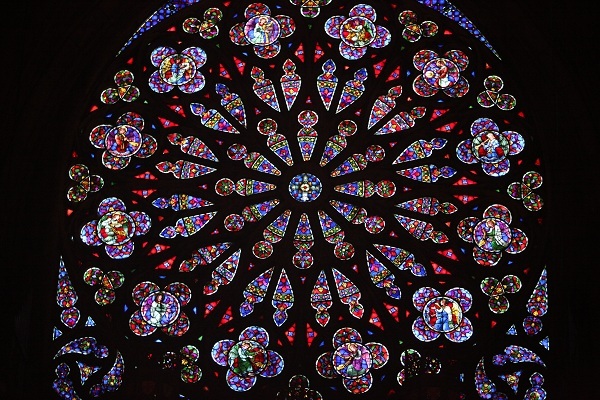 Most significantly, Charles Connick designed a series of magnificent clerestory stained glass windows and the facade rose window as well. 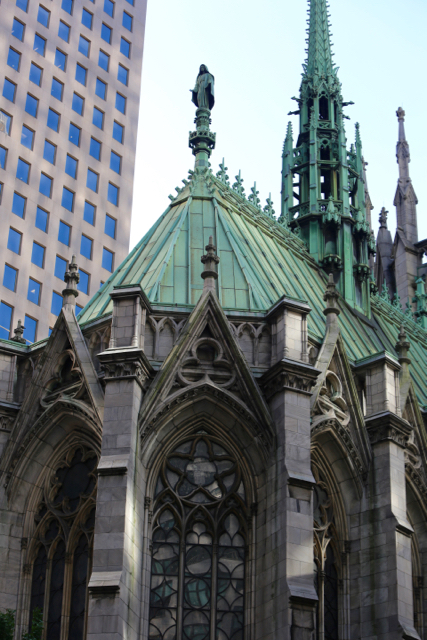 St. Patrick’s had now matched some of the fine decorative details of its recent rival for the title of premiere Catholic church in New York City, St. Vincent Ferrer. This restoration was by far the most successful work of art and architecture Spellman completed during his long tenure. We will pass over the long series of state visits, funerals and other events that took place here. We also will not review the lengthy story of the parish activity of the Cathedral. For St. Patrick’s was and is also a territorial parish with its own history of schools and other institutions. (Above and below ) The cathedral under restoration. In the background, Rockefeller Center. (Above) The cathedral bathed in light reflected from the neighboring Olympic Tower; (below) In turn, the cathedral’s image reflected in the tower’s glass wall. (Above) The (unrestored) interior: (Below) the restored sanctuary. 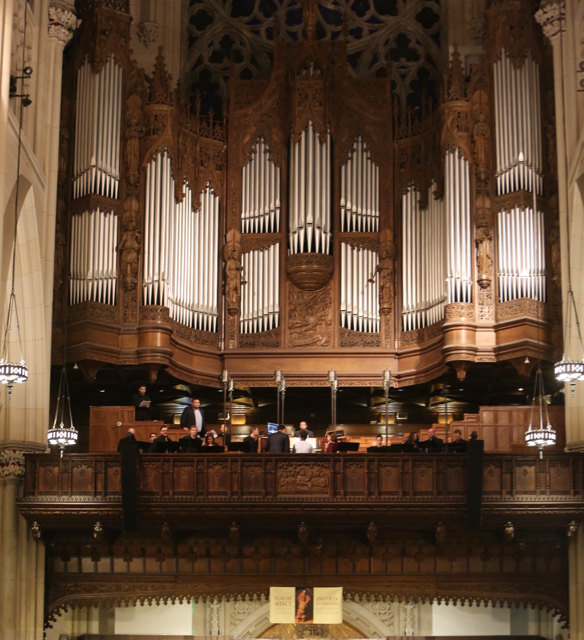 (Above) The gallery organ of 1930; a key component of a deliberate strategy to enhance the cathedral’s music presence in New York. The new (1927) music director, Pietro Yon (the composer of “Gesu Bambino”) led the initiative. (Above and below) The best aspects of Spellman’s renovations: the baldachin and the windows of Charles Connick (clerestory and rose). (Above) The exterior of the Lady Chapel. The statue is an addition of Cardinal Cooke. Post-1965 Restorations. 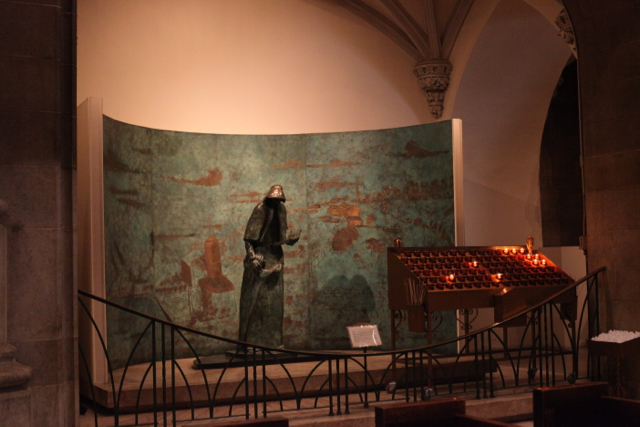 (Above) An altar, taken from St. Thomas in Harlem, replacing a modernist statue of St John Neumann installed under Cardinal Cooke; ((below) the equally inappropriate statue of Elizabeth Seton still stands. (Above) Votive candles – half size but twice the price! 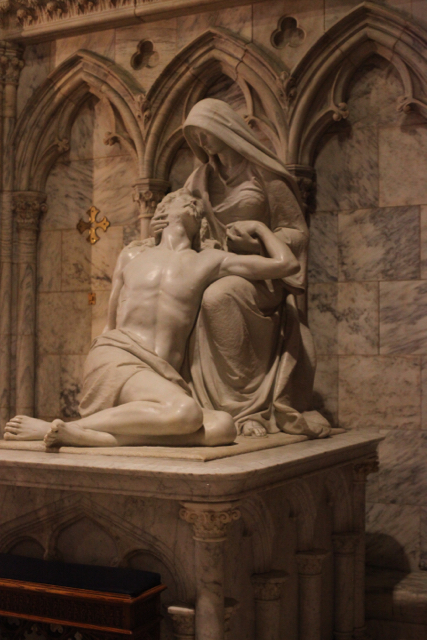 (Above ) The mainly 19th century statuary in St. Patrick’s – almost all in the interior – earned great acclaim in its day. (Below) St Bernard – part of a unique series of the Doctors of the Church. 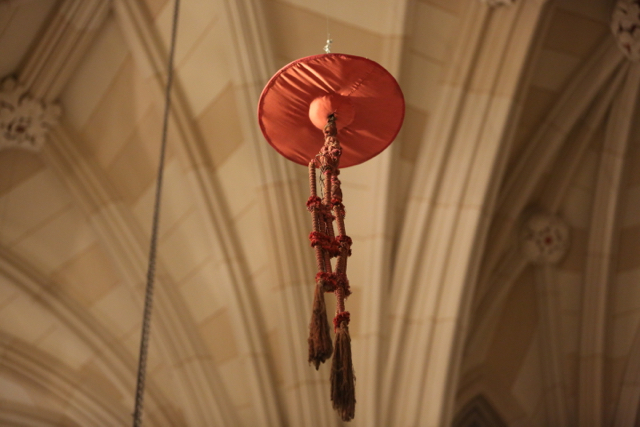 (Above) The Cardinals’ galeri hang once again from the ceiling – now in a side aisle of the ambulatory. End of part one. See part two.